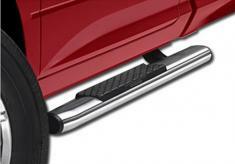 Ground Effects is a leading supplier of OEM tubular and roll-formed side steps and running boards. Manufacturing methods utilize state-of-the-art automation and other manufacturing techniques that provide outstanding quality and production capacity. Designed specifically for each OEM these steps come in a variety of durable finishes and carry the full OEM warranty. Manufacturing methods utilize state-of-the-art automation and other manufacturing techniques that provide outstanding quality and production capacity.